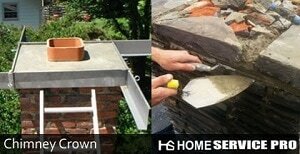 Home Service Pro offers chimney repair services to the residents of Calgary, Alberta, Vancouver, British Columbia, and the Vancouver Island communities of Victoria, Cowichan Valley, and Nanaimo. Basic chimney maintenance is required so that the chimney and fireplace doesn't suffer damage from the water and snow. When a chimney is not properly constructed in the first place, it will not function well, and can prematurely weather and become unsafe. It is important that the flashing system around the chimney and other roof entry points are properly installed and sealed. A poorly constructed chimney crown will result in damage to the mortar joints, chimney mass, smoke chamber, firebox and possibly other areas of your home. We offer full masonry fireplace and chimney repairs that include: chimney crown repairs & crown re construction, brick laying & brick replacement, mortar joint re tuck-pointing, roof flashing installations & water leak repairs, fireplace firebox repairs, smoke chamber repairs & reparging, rain cap & top sealing damper installations, as well as new chimney liner installations. The chimney crown is the top element of every masonry chimney, and in the Canadian Building Code is referred to as the Chimney Cap. This area can also be referred to as the chimney cap, concrete cap, or chase cover. Unfortunately, the crown, which is supposed to protect the inside of your chimney from water can quickly deteriorate and allow water to wreak havoc on the inside and exterior of your chimney. A properly functioning chimney crown should be constructed to provide an overhang with a drip edge to protect the sides of the chimney. This overhang should be at least two inches. Chimney liners should have a heat expansion joint between itself and the concrete crown. This will allow for the flue to expand and contract without causing damages when your wood burning unit is in use. This step is often overlooked by masons, and results in fracturing chimney crowns. In the Canadian Building Code, the firebox is defined as the fire chamber. It is common for the firebox in a fireplace to have fractures and gaps. When these gaps or fractures are 1/8" or greater, they require a high temperature cement repair (Masonry) or replace the manufacturer approved panel (Factory Built). When the fireplace firebox damage is not repaired, heat will penetrate, and heat up materials hotter than they are designed to withstand. Over time, low temperature heat to nearby wood framing will increase the possibility of a house fire. A firebox should be constructed with a firebrick that is at least two inches (51mm) thick. The mortar joints should not be larger than 1/4" (6.4mm) and composed of a medium duty high temperature refractory mortar. 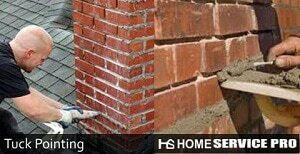 Referred to as tuck pointing (tuckpointing), pointing, repointing, spot pointing, & brick chimney repair. 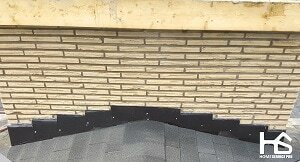 Tuck pointing (tuckpointing) restores the masonry mortar joints between your masonry bricks to eliminate water intrusion, prevent structural compromise, and restores the integrity & aesthetic value of your chimney. Tuck pointing (tuckpointing) can be defined as the removal and replacement of mortar between stone, block, or brick. Canadian Chimney masonry repair crews will replace the existing failing mortar with new mortar (tuck-point) to match the original masonry texture and color as closely as possible. Once mortar has been placed within the joint, it is then tooled. When done properly, tuck pointing (tuckpointing) will provide a strong, water resistant joint that will extend the life of your masonry chimney and prevent future brick chimney repair needs. Deteriorated brickwork weakens the chimneys structural integrity and allows cold drafts, water, and insects to invade your home. Penetrating moisture weakens the mortar that bonds the masonry units together; it also promotes premature deterioration of your brick causing brick chimney repair & tuck pointing needs. When Superior chimney brick chimney repair tuckpointing moisture finds its way into a defect on the brick and freezes, it will cause the brick face to spall (fall off), deflect, or displace. Once this happens, your brick is rendered useless, as it offers no structural support to the masonry structure. Improper installation, or lack of basic water sealing maintenance often results in water entering your home from the chimney area. When a chimney has an above roof inclination, it is important to have a roof saddle (cricket) in place to shed water and snow away from the chimney. The flashing should consist of base flashing installed under the roofing shingles. Each section of roofing shingles should have step flashing that is directly mortared into the chimney. The chimney should then have counter flashing installed. Most Roofers don't have the masonry training that Home Service Pro Roofers do. This is so important, as simply installing silicone or roofing tar, will not properly seal the roof-line. Most roof insurance claims do not include new flashing or step flashing installation. Like anything else on your home, a flashing system requires basic maintenance to ensure that everything is water sealed. Home Service Pro provides flashing repairs, as well as water sealant application to prevent water leakage into your roof and home. 1) Junctions with adjacent materials shall be adequately flashed to shed water. In order to prevent further water damage to your chimney and home, as well as to keep birds and animals out of your home, a chimney rain cap with a proper spark arrest should be installed. For those with multiple flues, it might be a good idea to have a top sealing damper installed. This will help prevent the "stacking effect" or smoke entering through the flue that is not in use.